Welcome back to another installment of Whispers of the Muse, our occasional deckbuilding series that takes a reader-submitted deck, then turns it over to the community to tweak and modify! 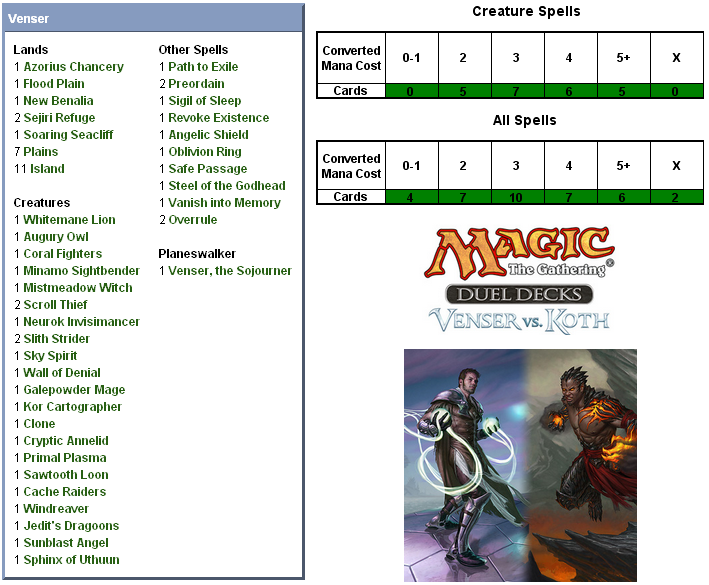 Today’s submission is a timely one, as Duel Decks: Venser vs Koth was only recently released. Werekill has been poring over it, sensing that there were improvements to be made but not quite sure where to begin. I think it would make a fun Modern deck, but other than adding a few cards like Lone Missionary, Mulldrifter, and a few Vensers, I’ve got no idea where to go with it. If you were rebuilding the deck, what would you keep? What would you cut? And what other cards would you bring into the deck? By the way, if you want to include some of the “blink” effects from the new set that’s about to release, I don’t mind. There’s an instant that does an instant Venser effect (ie puts on battlefield immediately instead of eot) for a single white mana, and theres a 2U card that does the same to 2 permanents at once. Those are good options, but there are older ones like Momentary Blink and Otherworldly Journey that are options too. The latter also adds a +1/+1 counter. Might come in handy if you’re not using undying. Huh, good point there. I like both of those for sure, and I’ll definitely keep them in mind. Thanks! And yeah, that’s what I was thinking. I don’t like Venser’s creature form too much, though. P.S. – I don’t know much about Modern, so some of these may be banned… (Stoneforge…?) Best check into that! Might not be real competitive, but it’d be fun to play!! Ha, well, even though the allies are good, I’m not going to use them. The only reason why is because a good friend of mine (and my main playtest partner) has an ally deck himself. I play casually only with modern cards, but double check me. Some might be DD reprints or something like it. I stripped mine down to basic lands and built it up from there. I used quite a bit of what was originally in the deck (I bought 2 of ’em), but I bet qutie a few of those won’t be modern legal. It really just depends on where you want to take this deck. I maxed out Clone and added in another O. Ring. Depending on how much bounce you have, you might consider, at least siding anyway, Prison Term. The ability to reattatch it without bouncing is nice and well worth the extra mana. I kept the Sphinx and maxed out Preordain. I can’t remember if I stuck some Foresees in it or not. I think I put a pair of Wall of Omens in instead of them. I didn’t use any artifacts, but I play casually. Basically a lot of nice ETB effects with a few counterspells on the side. Oh and a second helping of Venser. It all adds up, but you definately need some sort of finisher. I use the Sphinx it came with. The Angel just didn’t fit where I was going with the deck. Having a little instant bounce would be good too. Otherworldly Journey is a favorite of mine. Sounds like a plan. I’m considering getting another of these, but I’m going to try to split the cost with the friend so that I can just spend 10 on the Venser deck. He likes red, and the Koth stuff seems good for him. * Windreaver: It might be a lack of skill on my side, but I don’t cope with that creature. Being quite expensive for it’s stats, it requires to leave quite some lands untapped in order to make use of it’s potential. * Overrule: The same is true here. As the lifegain does not make that much of a difference there are better counters for at least 3 mana. * Galepowder Mage: More of him helps to enable free blinks. * Sky Hussar: At the same cost as the Windreaver, he comes with a more stable body as well as a nice ETB ability. * Preordain: Well, blue is part of the deck, isn’t it? You are wrong about Meddling Mage: when it is removed from the battlefield, the restricted card can be cast again. When it returns, you can name that card again (or another card), but the previous restriction will have disappeared regardless. Ok, you are right, my mistake. How did I forget about Sky Hussar? Great card. My VvK hasn’t come in yet, so I can’t remember if I put it in it or not. Knowing me, I probably did even though I doubt I’d use the draw too much in it. That shines best when you have tokens. No matter what it’s a nice combat trick. What do you guys think about the Windreaver at all? Am I the only one considering him a bit too clumsy and crying for replacement? I took him out for Aether Adepts. * Koth’s deck is all about putting Mountains into play, so Overrule hardly works out. Any other hard counter – I suggest replacing it with Negates – is better suited. * My best weapon against Koth himself was the Neurok Invisimancer. He didn’t last long against this little friend. * The Galepowder Mage proved to be an absolute blast. My opponent was willing to do any unfavorable trade in order to get him off the field. * On the other end of the table I almost always found two 3/3 (or even 5/5) first striking Plated Geopedes in the red zone. A touch of redirection? Redirect to be precise. Has a venser feel to it, imo. Another Wall of Denial and perhaps 2 Wall of Omens would help too. Depends on how far defense wise you want to go. I run just 2 WoO. Really basically what’s been said above too. Depending on what threats your Koth buddy palys, Prison Term may work as well as anything. The shifting nature of it is insane. I love Venser, and i have put several sunblast angel’s with a Sleep combination as a finisher. But, even without the Sleep, Sunblast keeps creatures at bay when they have the knowledge you could blink him and destroy all of his creatures that attacked. Also, Kor Hookmasters keep creatures at bay very well.